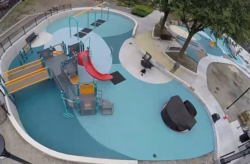 Many communities are taking a second look at the substances which are used in the surfacing of playgrounds across the company. 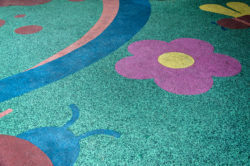 Are you looking for playground flooring contractors in Chicago? If you need to locate a poured-in-place rubber contractor in Chicago or elsewhere across the nation, Pro-Tech Surfacing, LLC has a range of solutions which are reliable and professional. The rubber poured-in-place compound is one of several playground flooring options available from us. 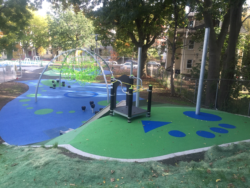 Playgrounds are often viewed as a location for children, but they are also great for adult activities which require smooth or semi smooth surfaces. Perma-Play is a two-layer system which is poured onto the prepared underlying surface. The materials consist of a base which is styrene-butadiene rubber and a wear coat which is made of ethylene propylene diene monomer (EPDM). Both of these products are blended with top quality binders. Perma-Play is soft, while being built to last. The finished surface is attractive and durable. It is also easy to clean. The PIP product has a number of different applications. These include playground surfacing, pool deck surfacing, running track surfaces, helipad surfacing, and patio surfacing. Our portfolio includes garage floor surfacing, walking trail surfacing and safety mats. Depending upon the project, the product can be used indoors or outdoors. Perma-Play benefits which may be of interest to those clients looking for a possible upgrade to their play area surfaces include IPEMA certification in order to meet ASTM F1292 standards. The product is ADA compliant, easy to maintain, endless custom design capability, slip resistance, and durability and resiliency. The ability to keep the surface looking attractive is another reason why clients are choosing Perma-Play to replace other surfaces. Pro-Techs Surfacing, LLC is serious about safety. The firm holds written validation from the independent laboratory that its surfacing materials conform to the requirements of the IPEMA. Perma-Mulch is another of our products. It is a 1-layer, low-maintenance solution ideal for budget-conscious safety surfacing for playgrounds, landscaping and other outdoor areas. The Mulch is made from high-grade binder and 100% recycled post-industrial and post-consumer rubber, Our products help to keep your play or recreational grounds safe, and also protects the environment. 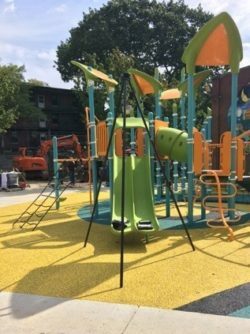 The playground surfacing contractors in Chicago can take their expertise to wherever your project is located. We make sure that the products are installed efficiently and accurately. If you need more information about us or our products, Call 330-576-6058 today for a free no hassle quote!